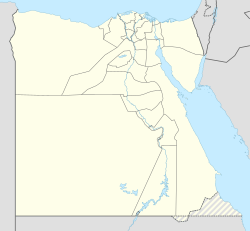 Abu Suweir Air Base is an Egyptian Air Force (Arabic: القوات الجوية المصرية‎, El Qūwāt El Gawwīyä El Maṣrīyä) base, located approximately 17.1 kilometres (10.6 mi) west of Ismaïlia and 116 kilometres (72 mi) northeast of Cairo. It is positioned for strategic defence of the Suez Canal waterway. During the Second World War the airfield, then known as RAF Abu Sueir or Abu Sueir Airfield (LG-205) was used as a military airfield by the Royal Air Force of the United Kingdom and the American United States Army Air Forces during the North African Campaign against Axis forces. In the mid 1950s, the base was the last station to be handed over by the RAF to the Egyptians. This was despite the fact that Abu Sueir and Fanara were the two bases to be retained, to be maintained by civilian contractors. Abu Sueir was handed over to Egypt on 14 April 1956. Today, the airfield is an active Egyptian Air Force Base. Its Second World War configuration is still evident in aerial photography. It houses the 60th Tactical Fighter Squadron of the 262nd Tactical Fighter Wing, flying General Dynamics F-16C/D Block 40s Fighting Falcons.